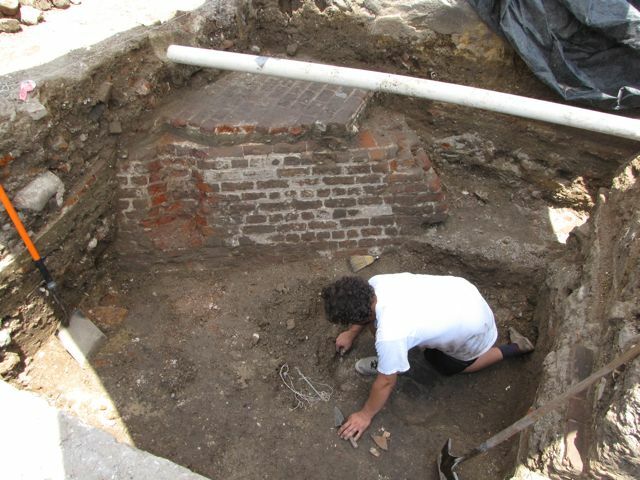 The College of Charleston archaeology students digging at the east end of Tradd Street (also known as South Adger’s Wharf) completed their second week of work today, and this dig is now half way to the finish line. In an effort to find the south wall of the redan, the archaeologists have so far opened the earth in three main areas as seen in the fore-, middle-, and background of the photo at the right. In the far left background of this image is the apex of the redan. The redan wall traverses diagonally through the open unit in the middle of this photo, and we had hoped to find its continuation in the open unit in the foreground. Because of the ca. 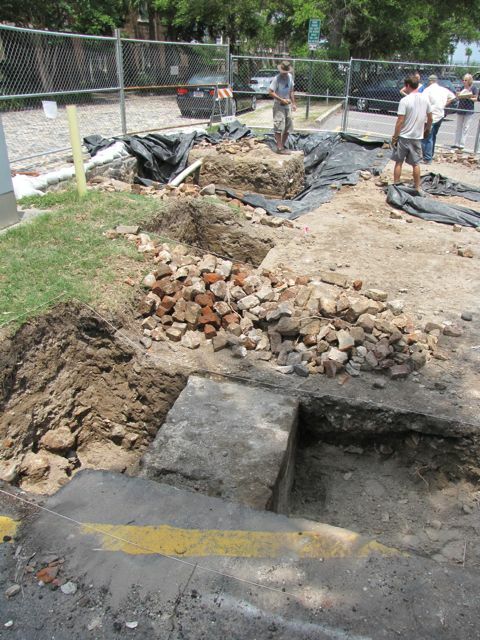 1805 brick foundation of Vanderhorst’s North Row, however, the redan has not yet been found in this western location. Perhaps next week we’ll have better luck. Back at our main point of interest, the area around the apex of the redan, the students removing the fill at the base of the colonial wall discovered a patch of bricks at a level that probably represent the 1760s. Those familiar with this project will know that when the redan was knocked down to street level at the end of the American Revolution, ca. 1784–85, the earth just east of the redan was strewn with bricks and brick fragments. We encountered plenty of that brick rubble at South Adger’s Wharf in 2008, and we’re finding plenty of it again this year. 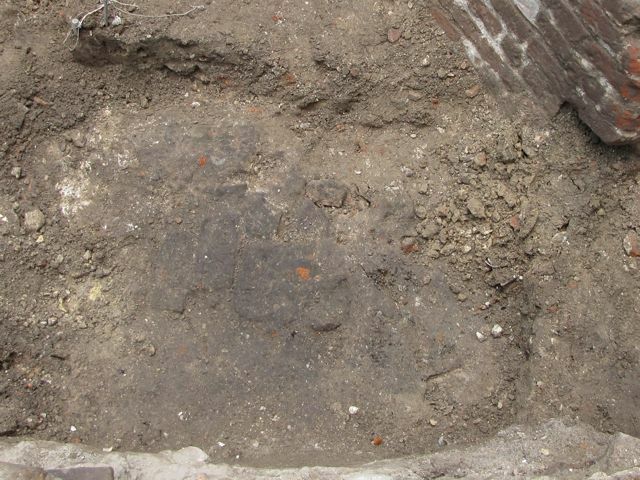 But the bricks unearthed today, just a foot or so southeast of the redan apex, appear to be large, intact bricks laid in a horizontal layer. Time did not permit a full investigation of this feature today, so it’s still a bit difficult to see this mystery brickwork clearly. Nevertheless, I’m including a photo of this feature at the right here for our curious readers. And of course the day’s work yielded some eyebrow-raising mid-eighteenth-century artifacts. 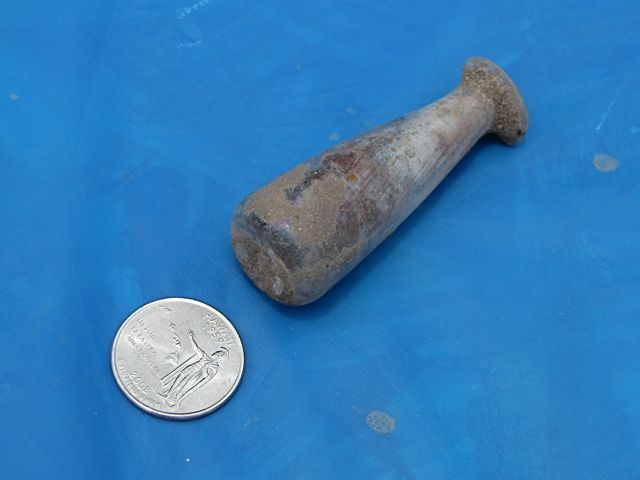 For example, the students unearthed a small glass vial or bottle, perhaps once used to hold medicine or some other precious liquid. Compared to the quarter in the photo at left, you can see that it’s quite a diminutive piece. The students screening the dirt in front of the redan also found two small rectangular scale weights, which is a logical find considering that a market stood at this site as early as 1750. In the photo to the right, you can see those weights in comparison to a recent U.S. quarter. 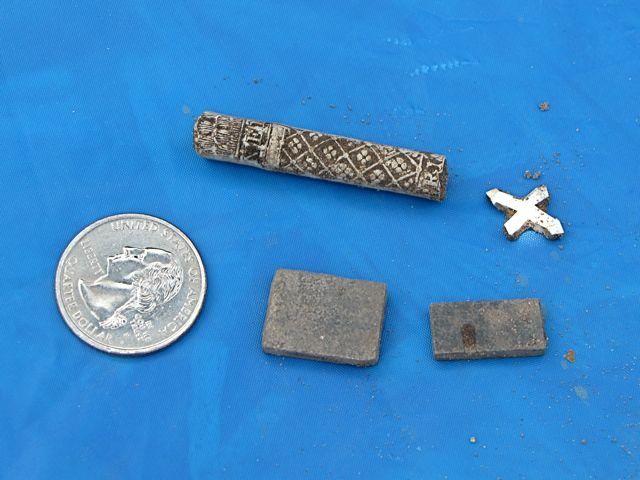 At the top center of this photo is a fragment of a clay pipe stem, which in itself is not a rare find at all. Hundreds of pipe stem pieces have been found in this dirt, but this one has been stamped and colored with a brown geometric pattern. Finally, the small white “X” in this photo is a small fragment of a pierced ceramic serving dish dating from the middle of the eighteenth century. What was once a piece of fancy dinnerware became broken trash at some point, and made its way into the dirt in front of the waterfront fortifications of colonial Charleston.